Onkyo TX-8150 review | What Hi-Fi? 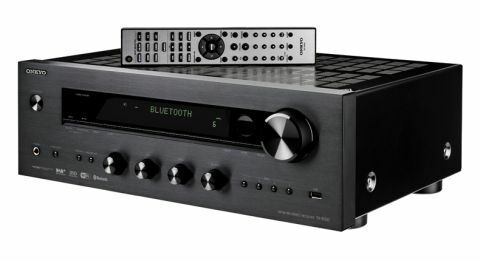 Don’t let the description of the Onkyo TX-8150 as a ‘network receiver’ underwhelm you: this unassuming, modestly priced box is a packed to the brim with every streaming feature you can think of, it has a powerful amplifier, a high-resolution DAC, and supports streaming services like Spotify and Deezer. If you have music stored on laptops and smartphones, it will play it. If you’ve got a turntable, it will play that too. All this for £550? That’s starting to look like one of the bargains of the year. But it’s not all about specs. The TX-8150 is an engaging performer that will have you listening to your music for hours on end. We kick off with The Dresden Dolls’ My Alcoholic Friends, played through our reference streamer into the Onkyo’s line-level input, and the TX-8150 charges through the punchy song with a cheerful and agile sense of rhythm. The low end is impressively taut and controlled, perpetuating a sense of tension that keeps you wanting more. There are no flabby basslines, no brash edges. It’s a full-bodied, richly detailed sound that’s enjoyable to listen to. We particularly like just how clear and revealing the TX-8150 is with voices. The wispy, breathy vocals of The Unthanks are wonderfully direct and nuanced, sounding sweet and packed with character. Big rock anthems sound loud and rousing, while orchestral pieces flourish in the big, airy presentation. Instruments are allowed ample space to flaunt their harmonies, with rich textures of guitar strings and piano notes delivered with confidence and ease. Judged by the highest standards, it could do with a touch more weight and impact with the drum kicks, and with more emphatic piano clunks, but at no point do we feel shortchanged. Switch to the digital coaxial input, and the result is a thinner, less vigorous sound. Voices aren’t quite as clear and upfront – there’s less body to the song and the dynamics shrink down – but that snappy, taut rhythm remains. It still makes you want to carry on listening. The true test of the TX-8150 comes when we stream using the wired ethernet connection. The sonic performance is strong: great rhythm, plenty of detail and a big, spacious sound that draws you into every song you’re listening to. Eric Bibb’s guitar strums are crisp and detailed when played in DSD and PJ Harvey’s voice sounds just as emotive and insightful when streamed. Bluetooth is surprisingly robust, too. With the soundtrack to Star Wars: The Force Awakens playing over Spotify from an Apple iPhone 6S, we’re easily hooked into John Williams’ masterful compositions. The TX-8150 charges along with nimble rhythm and a convincing sense of dynamism when playing the playful and sprightly Rey’s Theme. The only letdown is the moving-magnet phono stage. David Bowie’s vocals on Starman sound a touch reedy and lack any kind of vocal subtlety, with less of that soaring passion and sparking detail coming through. Ziggy Stardust deserves a far more nuanced and capable treatment. It’s the only major blip in the TX-8150’s box of tricks. But at this price level, we’re not expecting a truly fantastic phono stage. It’s a good feature to include so you have the choice of plugging in a turntable for a casual listen, but if you’re serious about your vinyl, invest in a separate phono stage. The Onkyo receiver is kitted out with a wealth of connections – not only are there six line-level inputs and that moving-magnet phono stage, but you can also connect your TV or set-top box using the optical and coaxial inputs. But it’s the TX-8150’s streaming capabilities that make it such a versatile machine. If your music collection is stored on a NAS box, laptop or smartphone, you can stream all those files through the TX-8150 and out of your favourite speakers – just make sure all the devices are connected to the same network. Or simply use Bluetooth or AirPlay to play songs directly from your smartphone or tablet. That’s not all: there’s native support for streaming services such as Spotify Connect, Deezer and TuneIn internet radio (although sound quality is a bit patchy). Add in DAB and FM tuners, and you’re unlikely to run out of music to listen to any time soon. It’s just as versatile/ubiquitous when it comes to music file types. The Onkyo TX-8150 doesn’t snub its nose at low-resolution recordings, taking standard MP3s and Spotify streams in its stride as well as hi-res 24-bit/192kHz FLAC and WAV files. You can play hi-res and DSD 5.6MHz files through all physical inputs, and when using the wired ethernet connection to stream. Connecting the Onkyo to your home’s network (and pairing with smart devices) is easily done through the set-up menu, and while the wi-fi works fine, it is more secure with the wired ethernet connection. If you are going to be using wi-fi, you’ll also be limited to 24-bit/88.2kHz files, and won’t be able to play any DSD tracks. You can, however, play DSD and other hi-res songs off a memory stick or hard drive using the front panel’s USB port. There are two sets of speaker terminals (if you want to drive speakers in a different room) and a 6.3mm headphone jack on the front panel gives you the option of some private listening in the twilight hours. As modern as its features are, the TX-8150’s façade remains distinctly old fashioned. In fact, it looks like one of Onkyo’s traditional AV receivers: a black rectangular box that focuses purely on function. Ideally, we’d like something that looks a bit more solid, stylish and special. But the buttons and knobs for the inputs and volume all work perfectly, and when a feature-laden streaming product such as this works without hiccups or stutters, we can’t complain too much. The black and green display is large and legible. You’ll be able to tell exactly what you’re listening to, through which input, and how loudly it’s playing with just one glance at the Onkyo’s fascia. The included remote control is just as practical, with neatly laid out buttons that are easy to operate. It works seamlessly with the receiver: there’s a button for each input, and they respond instantly. If you’re streaming from various devices around the house and listening to radio regularly, we’d recommend downloading the Onkyo Remote 3 app to make using it that bit easier. It’s free for Apple and Android users and the minimal interface is both fuss-free and straightforward to use. A dropdown menu lets you pick your source, and you can control the volume from each screen. It’s not a flashy app and there is the occasional lag, but it’s handy to have when you’re scrolling through long lists of songs. Everything about the Onkyo TX-8150 is practical and functional. While that’s a godsend for a streaming product, that alone doesn’t get this Onkyo the full five stars. What makes the TX-8150 a truly recommendable product is just well it performs. We found ourselves playing one song after another on the Onkyo, just enjoying how it sounds. The clear detail, fluid dynamics and agile rhythm makes every song fun to listen to. If you’re after a streaming system that does it all for a very tempting price, you can’t go wrong with this talented Onkyo machine.